The famous messaging app, WhatsApp keep on rolling out new features to remain in limelight. WhatsApp for Android is now rolling out a new feature for beta users namely, Private Reply. 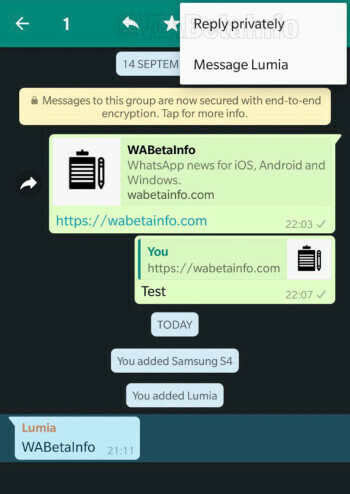 It is a basic feature and WhatsApp users were asking for it from ages, finally, their wish is granted. WhatsApp Private Reply feature allows users to send a private message with the help of a group message. That means that if you are doing a group chat with someone and you want to reply to some particular person which no one else should see. This can be done with the private reply feature with which you can reply to a particular message which has been sent in a group to that sender privately, meaning in the personal chat- no incognito mode yet. This feature will be the best fit for those group where only administrators can send messages. It does not matter if the group was closed, you will still be able to use the “Reply Privately” feature if the requirements are met. Right now the feature is only rolled out for Android Users however it is not confirmed yet when the Private reply feature will roll out for iOS users. Yesterday, WhatsApp’s mobile messaging Vice President, Chris Daniels revealed that the company is planning to put adverts in the WhatsApp status feature. It was expected, as a few months, back WhatsApp co-founder Brian Acton had told that Mark Zuckerberg had monetization plans for WhatsApp before the purchase was even complete. WhatsApp Status Tab will soon be flooded with Adverts.